Granny Takes A Dip // Butterbear // Hot Toddy Shower Gel // Holly Golightly // Cinders // Father Christmas // So White // So White Shower Gel. 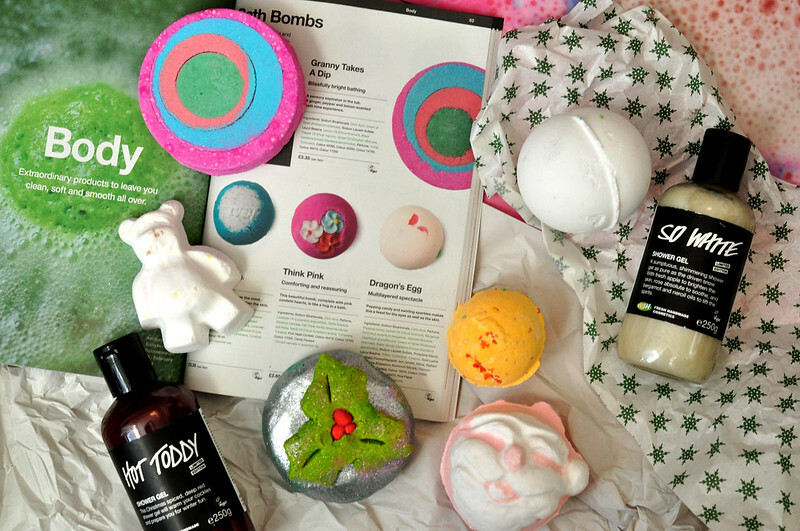 At the start of the month I shared the Lush Christmas products I bought this year and I may or may not have ordered some more. Someone please stop me from going back onto the Lush website!! Seriously though, there is nothing better than getting into a fancy bath with a good book to simply relax after either a long day at work or when I'm feeling particularly stressed or panicky. As I do every year, I just had to add So White, Cinder and Father Christmas to my order. These three scents just scream out Christmas to me and I'm excited to be able to use So White Shower Gel along side the same apple scented bath bomb. As they're quite small, I ordered two Butterbears and used one the night I got my order. It's the same as Butterball but in a cute bear shape. I prefer these smaller sized bath bombs, like cinders as well. as I often find the larger size just too big for my quite small bath, it always feels a bit of a waste to use the whole thing and quite expensive as well if you think about it. This has quite a subtle vanilla scent and feels incredibly moisturising on the skin thanks to the cocoa butter you can see floating in the water once it starts fizzing away which turns into an oil. The only non Christmas thing I bought was the Granny Takes A Dip bath bomb which I hadn't tried before. It's a ginger, pepper and lemon scented bath bomb that I only hope doesn't turn my bath water brown from all the different colours! Although not pictured, I also ordered from the Lush Kitchen for the first time and added Bearded Lady Bubble Bar to my order. Despite being a huge Lush fan and have been for years, I didn't really know about the Kitchen where they bring out limited edition products that only seem to appear on the site for a couple of days. They're all freshly made and the bubble bar feels a lot creamier and more moisturising than the others that I have do, they tend to dry out the longer you have them.